Twitter trolls linked to suspected foreign influence campaigns stoked controversy over pipelines and immigration in Canada, according to a CBC/Radio-Canada analysis of 9.6 million tweets from accounts since deleted. 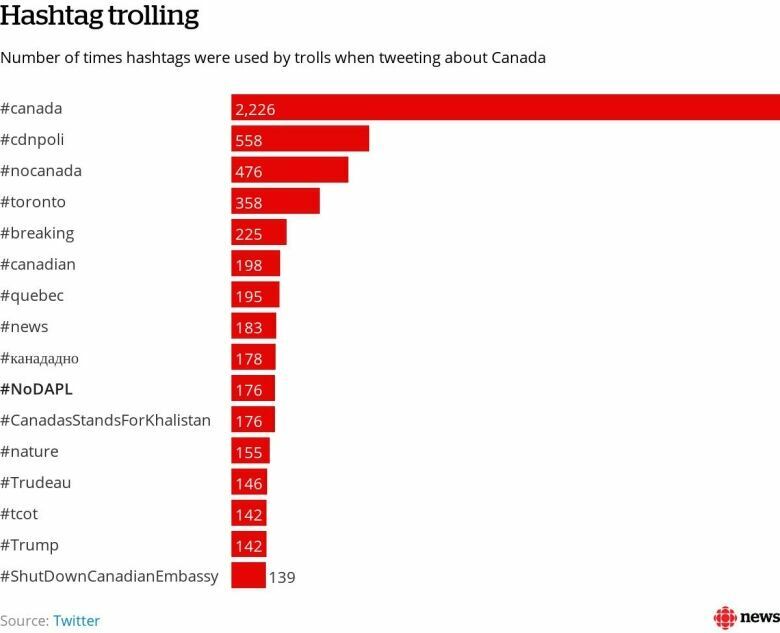 Roughly 21,600 tweets from those troll accounts directly targeted Canadians — many of them with messages critical of Canadian pipeline projects and tweets that highlighted divisions over Canada’s policies on immigration and refugees. The troll accounts, which have since been deleted by Twitter, are suspected of having originated in Russia, Iran and Venezuela. Since 2013, 245 of these accounts retweeted messages from Canadian activists, politicians and media reports about various pipeline issues, from potential environmental impacts to grassroots movements against the projects. Most of those pipeline tweets were sent on Jan. 24, 2017, when U.S. President Donald Trump signed an executive order to greenlight the Keystone XL and Dakota Access Pipelines. Tweets mentioning those pipelines were retweeted some 9,420 times across Canada and the United States. Although these inauthentic accounts and their tweets are no longer on Twitter, the social media company published them on Feb. 3 as part of its campaign to be more transparent and to combat foreign interference in elections worldwide. Last year, CBC reported that Russian trolls appeared to be trying to sow division among Canadians by tweeting provocative statements on hot-button issues like refugees and immigration. This new trove of tweets shows a continued campaign originating in different countries. The trolls appeared well-versed in Canadian debates about pipelines, quoting and retweeting prominent figures. The account of Greenpeace Canada climate and energy campaigner Mike Hudema, for instance, was the eighth-most retweeted by trolls. Hudema has been highly critical of Canadian pipeline projects and oilsands developments. The trolls retweeted him 53 times. CBC News was the account that saw the most troll retweets. According to scholar and Middle East expert Sami Aoun, Iran has a strategic interest in seeing Canadian and American pipeline projects fail. The regime also has a history of using the internet to spread propaganda, he added. “The Iranians are trying to short-circuit American sanctions by selling their oil in Asia. To keep a certain advantage in China and India, they might be trying to prevent Canada from developing pipelines that could give the country better access to those markets,” said Aoun, director of the Middle East and North Africa Observatory at Université du Québec à Montréal. Some of these inauthentic accounts may have had few followers, but their behaviour might indicate that they were trying to shape activist narratives on Twitter, said Kate Starbird, assistant professor in the Department of Human Centered Design & Engineering at the University of Washington. Starbird studied online discussions about the Black Lives Matter movement in 2016, when it became apparent that Russian troll accounts had managed to infiltrate both sides of the debate and play them against each other. Even if the accounts deleted by Twitter generated few retweets in return, they still could have posed an eventual threat, Starbird said. Although researchers had come across some evidence of online meddling years ago, they didn’t realize their importance until the 2016 U.S. election. “They were probably always important. We just weren’t noticing what’s going on”, she said. Alarms were raised last year over troll campaigns to influence Canadians and Americans on pipeline issues. More than 9,000 posts on various social media platforms linked to Russian political meddling were identified by a U.S. House of Representatives review. This trove of deleted tweets came to light barely a week after the Liberal government put in place a series of measures to counteract foreign influence campaigns targeting Canadian elections. In anticipation of the October federal election, Minister of Democratic Institutions Karina Gould announced on Jan. 30 the creation of the Security and Intelligence Threats to Elections (SITE) Task Force, made up of the Canadian Security Intelligence Service (CSIS), the Royal Canadian Mounted Police (RCMP), the Communications Security Establishment (CSE) and Global Affairs Canada (GAC). The group will be tasked with monitoring foreign influence threats online. Last year, the CSE produced an overview of potential cyber threats to the Canadian democratic process. It included bot networks and social media influence campaigns by foreign powers in its list of threats. Starbird puts the threat of online political meddling bluntly: “I assume that if you’re a person on this planet and you spend time online, you’re going to come across influence operations that are happening right now,” she said. Alongside the possible Iranian influence campaign, a slew of inauthentic Russian accounts also tried to target Canadians with messages stoking immigration fears and conspiracy theories. Many of these tweets reacted to major news events, such as the Quebec City mosque shooting and the travel ban on Muslim countries enacted by Donald Trump. The chart below shows the daily volume of troll tweets by topic. 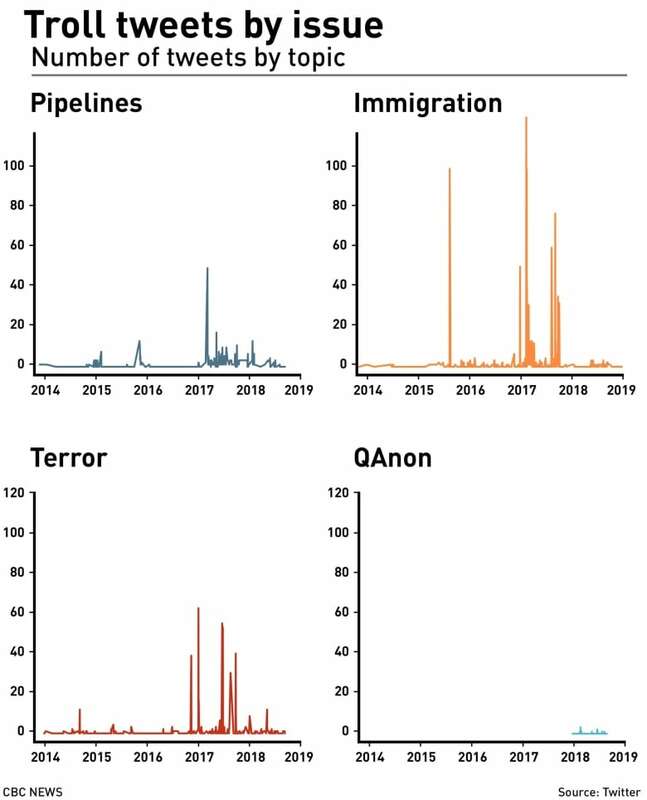 The peaks coincide with major events. Suspected automated Russian accounts also retweeted messages from at least 24 different seemingly Canadian accounts promoting the QAnon conspiracy theory. This baseless conspiracy theory claims that a high-ranking member of President Trump’s administration — known only as ‘Q’ — is secretly leaking information on the anonymous 8chan message board. ‘Q’ insisted in October 2017 that former presidential candidate Hillary Clinton had been extradited and would soon face a military tribunal. ‘Q’ also claims that Trump is on the cusp of triggering ‘The Storm’ — a far-reaching takeover of the U.S. government to expel “deep state” enemies of the administration. After some 2,600 ‘Q’ posts, none of its predictions have materialized. April 24th, 2018: RT @Awakentothyself: #QAnon #FakeNews #SaveOntario #TreasonousTrudeau Look how corrupt our government is. CBC downloaded and analyzed 9.6 million tweets released by Twitter on this page. 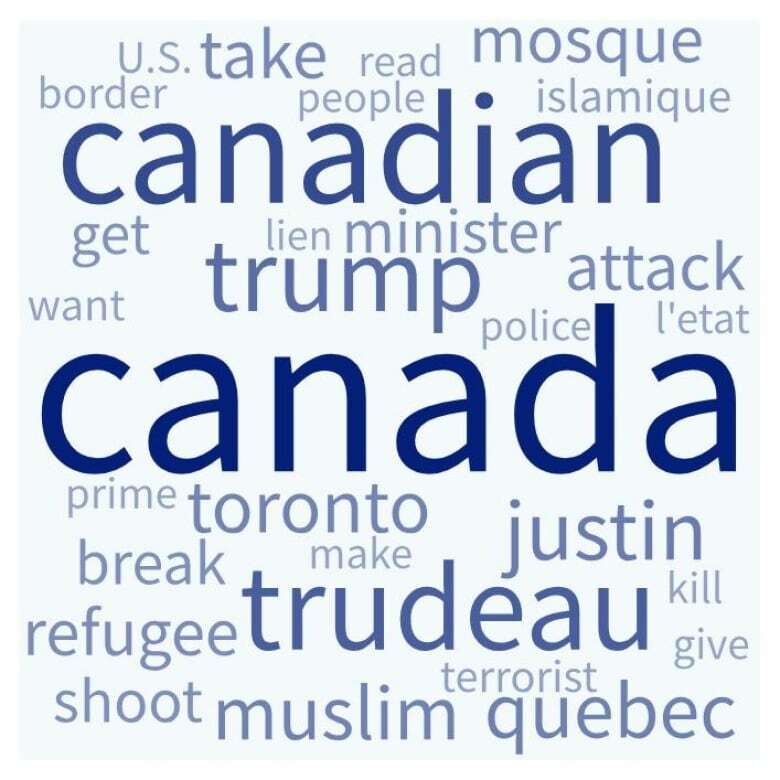 To isolate tweets targeting Canadians, the CBC searched the tweets for 67 keywords, including the names of public figures (Justin Trudeau, Andrew Scheer, Ezra Levant), places (Toronto, Alberta) and organizations (Kinder Morgan, CBC, NDP), as well as popular hashtags like #cdnpoli, #onpoli, and #polqc. These do not necessarily include all the tweets about Canada, while some U.S.-specific tweets may have been included in the search. The code used to analyze the tweets can be found on GitHub. Next articleAaron Ramsey: Was Arsenal midfielder undervalued & why Juventus?